MRIs (including open MRI scans) use radio waves and a magnetic field to diagnose medical conditions and monitor the effectiveness of treatment. Tahoe Fracture & Orthopedic Medical Clinic invites Hawthorne, Nevada, area residents to experience the open MRI technology that we offer at our various nearby locations. 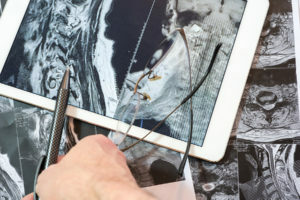 While X-rays can produce images of dense materials within the body, such as bones, MRIs are able to produce much more detailed images of soft tissues, including muscles, tendons, and organs. It is generally easier to tell the difference between normal and abnormal tissue on an MRI scan, as compared to a CT scan. X-rays and CT scans both require patients to be exposed to small amounts of ionizing radiation, while MRIs do not. The contrast substances used for MRIs are generally less likely to produce an allergic reaction, as compared to those used for X-rays and CT scans. At Tahoe Fracture & Orthopedic Medical Clinic, we understand that some individuals — including children, those with claustrophobia, and those with larger-than-average body sizes — may want an alternative to traditional closed unit machines, which require patients to be enclosed within a tube-like apparatus. That’s why we’re so pleased to make our state-of-the-art open MRI machines available to our patients. Our open MRI technology allows patients to undergo scans on wide, rotating tables, eliminating the need to be confined within the machine. If you’ve been told that you need to undergo an MRI, please consider having your scan performed in an open MRI machine at one of Tahoe Fracture & Orthopedic Medical Clinic’s locations near Hawthorne, NV. We’ve been serving this area since 1966, and we’re proud to make open MRI technology available to the residents of this community.